Evander Kane has been away from the San Jose Sharks for some time now, and today we found out why. Kane took to Twitter to explain that his expecting wife had lost their daughter, obviously explaining his absence and unavailability for the Sharks. Everyone at PHR passes along their well wishes to Kane and his family during this time. Kaapo Kakko scored again today and broke the Finnish top league’s record for scoring by a player under the age of 18. With 22 goals on the season Kakko passed the previous record holder Aleksander Barkov, who scored 21 in 2012-13. The 17-year old Kakko is expected to go second overall in the upcoming draft, but was recently ranked as the top available prospect by Sam Cosentino of Sportsnet. Not only will Erik Brannstrom be in the Ottawa Senators lineup for the first time tonight, but Max Veronneau will also make his NHL debut. The 23-year old forward was just signed out of Princeton this week and will immediately try to make an impact for the Senators. The team is focused on developing their young core as they rebuild, and giving a chance to college free agents is obviously a big selling point when trying to recruit them. Already without Norris Trophy winner Erik Karlsson for Sunday, the San Jose Sharks could be without another Norris Trophy winner on Sunday as well as defenseman Brent Burns skipped today’s voluntary practice with a flu bug and is listed as questionable for Sunday’s game against the Chicago Blackhawks, according to the Mercury News’ Curtis Pashelka. Oh, and Burns currently holds the iron man streak of 454 straight games played. There’s a “little bit of a flu bug going through the team,” said Sharks’ head coach Peter DeBoer. The team already announced that Karlsson will miss Sunday’s game due to re-tweaking a groin injury last week. However, the team hasn’t played a game without Burns on the ice since Nov. 21, 2013. The defenseman currently leads all Sharks with 71 points in 65 games and is in the running for his second Norris Trophy in the last three years. If Burns can’t play, the team is expected to utilize Joakim Ryan to replace him. Ryan hasn’t played in a game since Jan. 22. Sticking with the Sharks, The Athletic’s Kevin Kurz reports that Evander Kane’s remains questionable for Sunday’s game after missing Friday with an undisclosed middle-body injury. Kurz writes that the injury to Kane is not considered to be serious. The 27-year-old has 27 goals and 51 points this year and is closing in on career highs in both areas. The Athletic’s Lisa Dillman (subscription required) suggests that this may be Jonathan Quick’s last season in Los Angeles as the team might be looking to trade their longtime goaltender. With a solid season by backup Jack Campbell and the impressive play of rookie Calvin Petersen, the team could consider moving on from Quick. While most teams in need of a goaltender might be looking at Sergei Bobrovsky as their first choice, Quick might make a solid second option for teams who miss out on Bobrovsky. Of course, the 33-year-old Quick isn’t having his best season as he has just 11 wins, a 3.31 GAA and a .897 save percentage and is owed $5.8MM for four more years. However, most people expect Quick to rebound after a tough, injury-plagued season. David Schoen of the Las Vegas Review-Journal reports that Vegas Golden Knights fourth-liner William Carrier, who has missed six straight games with an upper-body injury and has appeared in only 48 games this season, could begin skating today and could return to the lineup within the next two weeks. Carrier is second in the NHL in hits with 247 this season, two behind teammate Ryan Reaves. With the trade deadline fast approaching, we will be taking a closer look at the situation for each team over the coming weeks. Where do they stand, what do they need to do, and what assets do they have to fill those needs? As we begin to examine the Pacific Division, here is a look at the San Jose Sharks. The moment that the San Jose Sharks traded for star defenseman Erik Karlsson, many people felt that the Sharks would be at the top of the Pacific Division. While no one was expecting the Calgary Flames to be so dominant, the Sharks are solidly in second place and with their impressive play of late, it wouldn’t be a shock if San Jose found their way back during the team’s stretch run. The Sharks have been rolling, having won 10 of 14 games and three of those games were a streak when they were forced to play without Karlsson. With a number of veteran players trying to hold on for another deep playoff run, including Joe Thornton, Joe Pavelski and Brent Burns, it wouldn’t be a surprise if the Sharks picked up another significant piece to their plans to win this season. The team went out a year ago at the trade deadline and picked up Evander Kane from Buffalo, eventually locking him up long-term and they followed that up by adding Karlsson during the offseason. Throw in the fact that Thornton hasn’t been 100 percent this season and isn’t the same player due to his knee injury and the need for more depth is obvious. No one would be surprised if general manager Doug Wilson tries to pry another major piece. This is where the Sharks might have some problems. The team has already moved its first-round picks in 2019 and in 2020 as they moved their 2019 pick to Buffalo for Kane and then their 2020 first-rounder for Karlsson (pending multiple conditions that are likely to hold). The team has already unloaded several key young players and prospects in separate deals, including Chris Tierney, Rudolfs Balcers, Danny O’Regan, and Josh Norris. It’s been made clear that the Sharks aren’t interested in moving too many more prospects, leaving the team bare of incoming prospects, but regardless, time is running out for a number of their veterans and with the dominance of several teams, the Sharks will want to keep up with them. Regardless, the team may have few choices. One player the team could consider moving out would be forward Kevin Labanc, who has five goals and 30 points this season, but hasn’t been able to break into the team’s top six. The 23-year-old still has plenty of promise and might be able to being in a significant return for a player who tallied two 100-point seasons in the OHL. The team also could dip into their prospect pool that has a number of talented players, including 21-year-old goalie Josef Korenar, who appeared in the AHL All-Star game this year, AHL forwards Dylan Gambrell and Francis Perron, as well as highly-touted offensive defenseman Ryan Merkley, and junior forwards Sasha Chmelevski and Ivan Chekhovich. 1) More forward depth: The team has a solid top-six, but the third line has been average at best and hardly the scoring line the team was hoping for at the beginning of the year. With Thornton ailing, the team could use a sniper, potentially who has some experience manning the center position to improve the bottom-six. Thornton has just 10 goals and 25 points in 43 games this season and looks like he’s heading for his most disappointing season so far. While Marcus Sorensen has shown improvement, the forward has just 17 points this season, while Labanc still hasn’t full proven himself to head coach Peter DeBoer. It wouldn’t be surprising if the Sharks went to the Ottawa well again, having already worked out deals to take Mike Hoffman and Karlsson from the Senators. A rental like Matt Duchene or winger like Mark Stone would force the team to adjust their lines and put some quality offense on their third line. 2) Defensive depth: With an injury, as well as poor play, coming from Marc-Edouard Vlasic, the team may want to bring in a veteran defenseman who could provide the team with some strength behind the blueline. The team has gotten surprisingly good play from defenseman Radim Simek, who the team signed out of the Czech Republic last summer. However, the team needs more help there and don’t have too much help at that position down in the AHL. Couture, who signed a long-term deal this off-season, is the centerpiece of the Sharks’ offense for the foreseeable future. Couture has as much right as anyone on the team to criticize their efforts, seeing as he has done his part so far with 25 points in 26 games. While Couture did not name names, it is easy to point at Karlsson, last year’s big acquisition, Evander Kane, and a lackluster bottom-six as those that need to step up if the Sharks wish to play to their potential. Perhaps Couture being open and honest about the team’s disappointing results that will flip a switch and turn this team into the true contender they should be. It was Auston Matthews and the Toronto Maple Leafs who took down the Sharks last night and the young superstar played very well in his return to the lineup. Even in the midst of the final days of the William Nylander drama, Toronto continues to win and remain focused on the present. But what if their struggles to sign Nylander are just the beginning? The Leafs face quite the cap crunch moving forward and there is concern that a Nylander signing could eventually push out either Matthews or Mitch Marner. Fox Sports’ Andy Strickland relays word from sources around the league that Matthews could be a prime target for an offer sheet this off-season. Although rare, due to their financial cost and draft pick cost, a maximum offer sheet isn’t out of the realm of possibility for a young player of Matthews’ caliber. Strickland asks what the Leafs could possibly do, with so many RFA’s and a defense in need of rebuilding this summer, if a team was to offer Matthews a contract worth $14MM per season? Such a situation seems far-fetched, but may be more grounded in reality than we know. It would be yet another difficult obstacle for the Maple Leafs who are truly having trouble with having so much talent on their roster. The Boston Bruins retired Rick Middleton’s number tonight, making him the eleventh member of an illustrious group of all-time greats. The question now turns to who could be next to join the Bruins’ stars in the rafters? Of their recently retired players, the one who truly sticks out is two-time Vezina Trophy winner and Stanley Cup hero Tim Thomas. Although Thomas’ career was not a long one, he was one of the top goaltenders in the NHL for several years and is arguably the most clutch postseason keeper in NHL history, with the league’s all-time best playoff save percentage. The Athletic’s Fluto Shinzawa asked one of the Bruins’ retired numbers, and the team’s current president, Cam Neely, for his thoughts on Thomas’ case, but he didn’t seem optimistic about the odds. Neely points to longevity as working against Thomas, but did not rule him out completely. “There’s no question, that team in ’11, what it meant to Bruins fans and New England. Timmy, what he did in that playoffs, not just in the finals but all of the series, was pretty impressive”, but Neely added “I don’t want to rule anything out, but you look at some of the guys up there, they have a bigger sample size of what they did throughout their career in Boston.” It seems that Thomas, who was a star in his own right but simply over a short period of time, faces an uphill battle to have his No. 30 retired. Instead, current long-time players Patrice Bergeron and Zdeno Chara are likely next up to be immortalized by the Bruins. A year ago today, the Ottawa Senators made a three-team deal with the Colorado Avalanche and the Nashville Predators. Since then, names like Erik Karlsson, Ryan McDonagh, Rick Nash, Evander Kane, and Tomas Tatar (twice) have all been traded. Yet, it’s that November 5th deal that is still the most memorable recent trade for many, due to both the immediate impact and the lasting results. In that trade, Ottawa – at a contract impasse with center Kyle Turris – dealt he, first-round prospect forward Shane Bowers, goaltender Andrew Hammond, a first-round pick, and a third-round pick to Colorado. The Avs then flipped Turris to Nashville for defenseman Samuel Girard, forward Vladislav Kamenev, and a second-round pick. It was quite a haul for Colorado and they have yet to even use either of Ottawa’s picks, including a likely lottery pick in the first round next year. The Predators meanwhile signed Turris to a six-year extension and he has 53 points in 79 games since joining the team. The return for all of this for the Senators? Matt Duchene, who a year later is in limbo with an expiring contract and a team that is far from the contender he was promised. As TSN’s Ian Mendes notes, Senators GM Pierre Dorion was coming off a 2016-17 season that saw his team make a run to the Eastern Conference final. When he acquired Duchene, he thought it could be the final piece of the puzzle to get them back and through that third round of the playoffs. Instead, Ottawa sunk to the second-worst record in the NHL. It’s too late to reverse that trade or the events of last season. The team could have simply traded Turris for picks and prospects at the deadline, as Mendes points out, and certainly could have found a deal for a top-six forward this off-season that was far less expensive. Their first-round pick in 2019 could be first overall, franchise center Jack Hughes, and there’s nothing they could do. Boston University standout Bowers could blossom into a top-line forward, but there’s no recourse for that. The only element of the trade left in the control of Dorion and the Senators is the future of Duchene and with it potentially the future of the team. Ottawa is faced with two choices this season: pay Duchene or trade him. The 2009 third overall pick carries a $6MM cap hit on his current contract. If he were to hit the open market, he would certainly be due a raise. Duchene’s alleged reason for wanting out of Colorado last season was ironically that he didn’t want to play through a rebuild. If that is still his mindset, it would take a substantial sum from the Senators to keep him around. Owner Eugene Melnyk has been unwilling to pay his better player their fair value, leading to the Karlsson trade and likely more moves to come. Will he make an exception for Duchene? If not, the Senators need to move Duchene and sooner rather than later. The trade deadline will be the final opportunity to trade the star center, who will have a long list of suitors, but his value drops each day leading up to that point. Dorion will likely never get back a package commensurate with what he gave up for Duchene, but his best chance to get close is to trade him as soon as possible to the highest bidder. Either option serves to benefit the Senators. Duchene may not be a superstar, but he is a talented, well-rounded player who is capable of leading Ottawa out of the basement if provided with at least a little support. On the other side, the team cannot escape the reality of their own rebuild and could greatly use the trade capital that they would gain from a Duchene trade. The worst case scenario – and a veritable death knell for the franchise – would be to make neither decision, opting not to trade Duchene and waiting and hoping for an extension agreement only to watch him walk away in free agency. One year later, this notorious trade is still so prevalent around the NHL. The Senators should celebrate the anniversary by making another major move with Duchene – a new contract or another trade – as soon as humanly possible. The San Jose Sharks have done a nice job of re-making their roster over the past year, adding players like Erik Karlsson and Evander Kane to an already talented roster, but one area the team still needs help in is that the center position, particularly the third-line center position that was vacated by Chris Tierney when the Sharks traded him to the Ottawa Senators in the Karlsson move, according to Paul Gackle of The Mercury News. After starting the season with Finnish import Antti Suomela for the first 13 games, Sharks head coach Peter DeBoer said he intends to sit Suomela and look at other options for that spot. DeBoer believes that there are three in-house candidates who can take that center spot on the third line, including Suomela, Rourke Chartier and Dylan Gambrell. DeBoer hasn’t given up on Suomela being the answer, but notes that many players struggle after the first exciting stretch of games. Perhaps the biggest move of the off-season was completed earlier today, when Norris Trophy-winning defenseman Erik Karlsson was traded by the Ottawa Senators to the San Jose Sharks. The return: two-way NHL forward Chris Tierney, rookie forward Rudolfs Balcers, collegiate center and 2017 first-round pick Josh Norris, young depth defenseman Dylan DeMelo, and four draft picks. While the Senators don’t know for sure how the likes of Norris and Balcers will pan out, the players acquired in this deal are somewhat identifiable assets with ascertainable ceilings. The picks carry far more potential; however they also each carry conditions. The earliest possible pick chronologically would be a 2019 first-round pick. The Sharks owe the Buffalo Sabres their first round pick in the next NHL Draft as a condition for re-signing winger Evander Kane, but with the additional condition that they make the playoffs. Should they miss the playoffs – a catastrophic result for a team that now has meteoric expectations – the team could opt to send that pick to Ottawa and their 2020 first-rounder to Buffalo if they so choose. If not, and the Sharks make the playoffs as expected, the Senators will land that 2020 first-round pick. Ottawa will still have an early pick from San Jose in June though, perhaps even earlier than expected. The condition on that pick is that it is the highest of the second-round picks owned by the Sharks: their own and the Florida Panthers’, which ironically was part of the return from the Sharks’ flip of former Ottawa forward Mike Hoffman earlier this year. Florida is expected to improve this season, but playing in the Atlantic Division with the Tampa Bay Lightning, Boston Bruins, and Toronto Maple Leafs means the Panthers face an uphill battle to make the playoffs and could easily end up with a draft slot in the first half of the second round. Whereas, the Sharks should by all accounts be a playoff team and more in the coming season. Speaking of Hoffman, the Senators learned from that experience with Sharks GM Doug Wilson. As Sportsnet’s Chris Johnston notes, Ottawa threw in what may as well be a “Mike Hoffman Clause”. After San Jose traded for Hoffman only to trade him hours later to one of the Senators’ division rivals, GM Pierre Dorion added a conditional future first-round pick if Karlsson is traded back to the Eastern Conference this season. The pick must be exchanged by 2022 at the latest. Finally, the Sharks sent a 2021 second-round pick to the Senators that carries two conditions. The pick itself is conditional upon San Jose re-signing Karlsson, whose current contract expires at the end of the season. If the Sharks both appear in the Stanley Cup Final this year and extend Karlsson, that pick becomes a first-rounder. In summary, at worst the Senators will receive a second-rounder in 2019 and the Sharks’ first-rounder in 2020 and at best they receive three first-round picks between now and 2022 and potentially a first-round and early second-round pick next year. One condition that is already looking good for the Senators is the one that hinges on Karlsson re-signing in San Jose. Although there has been no word from the star defenseman’s camp on his future or thoughts on a contract extension, Wilson already has the future in mind. Although the relatively underwhelming return for a player of Karlsson’s caliber reflects the risk of just one year remaining on his salary, Wilson made the deal with hopes of keeping him around for much longer. Wilson told the gathered media this afternoon that “It’s a long-term approach and we think Erik fits for now and for a long time.” While Karlsson has been clear that he wants to be the highest paid defenseman in the NHL and that would be best served on the open market, the Sharks have the salary cap composition moving forward to meet his contract demands. If the season goes according to plan and the Sharks win or come close to winning the Stanley Cup, with Karlsson playing a key role for what on paper looks like the best defense in the league, he could be tempted to skip free agency and re-sign in San Jose. Although the Karlsson trade was between just two teams, there is no way to truly evaluate the reverberations of this trade without discussing the Colorado Avalanche. The Senators have changed the tone of their public relations approach following this trade, being clear that they have entered a rebuild. However, the fact remains that the Senators don’t own their first-round pick next season. That selection belongs to the Avs as part of the Matt Duchene trade. With Karlsson’s departure, the team that many pegged to be the worst in the league has now lost their best player and have an even better chance of finishing the season in 31st place. This would also give them the best odds in the NHL Draft Lottery and the best odds of drafting projected franchise center Jack Hughes. However, that fate belongs to Colorado, who now stand a very high chance of seeing an already lopsided return for Duchene reach its maximum value. The 2018-19 Senators season will now likely matter more to Avalanche fans than it does to their own. To make matters worse, publicly committing to a rebuild could mean that Duchene, an impending unrestricted free agent, doesn’t even last the season on the Ottawa roster. I feel good. I know my birth certificate says 39, but I think not playing a full 82 games and playoffs last year, my body feels really, really good and I feel healthy. It’s kind of like a lockout year for myself, you get time to refocus and finally train a little bit and go again. I’m real excited for the year… I think when I’m out there I dictate the play. It doesn’t matter who I play against, I usually dictate the play. I’ve had that criticism for 22 years. I think I’ve kept up pretty good. Thornton is coming off his second straight season with a major knee injury, having torn the MCL and ACL ligaments in his left knee in 2016-17 and then again in his right knee midway through last season. Thornton tells Kurz that his left knee didn’t feel fully comfortable until November of last year, but that he made better progress with his right knee. While Thornton did miss the final 35 games of the regular season and did not appear in the playoffs, he admits that he was “real close” to getting back into the lineup. As such, he has been able to prepare this summer like any summer, with two healthy knees for the first time in a while. If truly back at full strength, Thornton could be a season-altering presence for the Sharks. The 39-year-old managed to post 36 points in 47 games last year and part of the campaign he was still dealing with injury. The last time the big center played a full season, he registered 82 points in 82 games in 2015-16. Overall, the future Hall of Famer has 973 points in 961 games since coming over to San Jose all those many years ago. With the likes of Joe Pavelski, Logan Couture and Evander Kane and youngsters Tomas Hertl, Kevin Labanc, and Timo Meier up front, Thornton has plenty of weapons to work with and could find his way back to elite level production. If that happens, it could push the Sharks over the top in their search for an elusive Stanley Cup title. The team has gotten great play from their youth in the last couple of years as several players have taken that next step and become regular contributors to the Sharks’ lineup. Meier may be one of the best as the 21-year-old broke out with a 21-goal season last year. The ninth-overall pick in the 2015 draft looks ready to continue a top-six role and perhaps become a key contributor there for many more years. Meier is also playing for a big payday, so if he can take that next step and develop into a 30-goal winger, he would be heading in the right direction. Gambrell only managed to appear in three games for the playoff-bound Sharks after he signed out of the University of Denver. The 22-year-old center is likely to force his way into a forward role in the bottom-six after he posted three straight 40-point seasons in college. Labanc, who had struggled with consistency in previous years with San Jose, finally broke into a full-time role with San Jose and produced 11 goals and 40 points. He could be primed for an even bigger year, just in time as his entry-level deal will run out. Much of the Sharks success in the next few years will come down to the play of Thornton and Pavelski, two players that have helped carry the team during their years of success. Both players are on their final year of their deal. Thornton signed a one-year deal and only time will tell whether he will continue that career at age 39. Despite suffering a torn MCL in January, he still posted solid numbers, scoring 13 goals and 36 points in 47 games. His days of posting 80 points are likely over, but if he can prove he can still produce, he could be back for several more one-year deals. Pavelski is another matter. The 34-year-old is starting to decline, but likely wants to ink one last long-term deal. While it makes sense that both sides will eventually come to an agreement, much is depending on the success that Pavelski has this season as well. The team was able to convince Dell to re-sign with the team for two more years as Dell, who has been a great backup to the team, was having a solid year once again. While his goals against wasn’t that impressive, at 2.64, Dell played in a career-high 29 games, had 15 wins and a save percentage of .913. Had he not signed an extension, he likely would have been heavily coveted by several NHL teams. And at just two years, he provides quality depth at that position. Tierney took a surprising leap in his production as he posted career-highs in goals, assists and points as he tallied 17 goals, 23 assists and 40 points, mainly as a third-line center. With Thornton coming back healthy, Tierney will likely take that same role once again, but is just an injury away from being a top-six player for the team. DeMelo is an interesting case as the 25-year-old started the season as the seventh defenseman, but moved into the lineup and never looked back. Regardless, the team opted not to offer him an offer sheet, but then signed him back anyway, suggesting they don’t necessarily consider him to be a major piece to their defensive puzzle. Braun has been a mainstay on the team for years, while Dillon is starting to come around as well, even if he’s already 31 years old. The team locked up Burns to an eight-year deal in November of 2016 and then followed that up by signing Vlasic to a eight-year deal in July last year, which is good news for the Sharks as they are the core of the team’s defense. While that is good for the present, those two deals could become issues in the future as both defensemen are already in their 30’s. Burns’ last season of the contract will be played out at the age of 39, while Vlasic will be 38. That could come back to haunt them later. Couture is in a similar position after he signed a new eight-year deal this offseason. Couture, who is coming off his best season ever after scoring 34 goals and 61 points, but the extension won’t kick in next year when he’s 30 and will run until he is 38, which also could become an issue down the road. Interestingly enough, the most criticized deal was the seven-year, $49MM deal given to Kane, but at age 27, the deal will run out when he’s 34 years old, which means if his play has declined, the impact would be minimum. Kane, who struggled with attitude in a losing situation in Buffalo, thrived in San Jose with a winning group of veterans. Kane, acquired at the trade deadline, posted nine goals and 14 points in 17 games was a key sniper for the team in the playoffs, scoring four goals. Perhaps the most interesting extension went to Hertl, who proved to be a valuable scorer as he scored 22 goals and went on to sign a reasonable deal at four years and just $5.63MM. His improvement and continued development will be key to their long-term future. Jones is also a solid deal. With goaltending salaries escalating, Jones’ $5.75MM deal is very pedestrian, which is good for a veteran goaltender who posted 30 wins and a .915 save percentage. The Sharks have done a great job of building a core of players and youth that should be able to compete for another five years. The hope is that as their veterans get older, the young players will take that next step and take over. The team might be right up against the cap and will be forced at times to make some moves, but there is no immediate need to fear that the team’s salary cap situation will spin out of control. 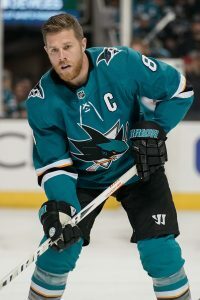 There are few major contracts the team will have to add in the next couple of years besides a possible extension for Pavelski. Are the San Jose Sharks done for the summer? In a mailbag for The Athletic, Kevin Kurz addresses the concerns of some fans that the team has not done enough this off-season after missing out on John Tavares. Kurz states that GM Doug Wilson still has the full faith and support of ownership – as he should seeing that the Sharks have the highest average finish in the league during his tenure – and reiterates that Wilson always says that the roster isn’t complete until the trade deadline. Given that San Jose hit a home run with the Evander Kane trade this past spring and fueled their Stanley Cup run in 2016 by adding James Reimer, Nick Spaling, and Roman Polak, that mantra has been proven true. However, is waiting until March going to cut it this season? Kurz points out that between Tavares, Ilya Kovalchuk, and Max Pacioretty, it seems that the Sharks wanted to do more this summer. Pacioretty is still one of several potential trade targets prior to the beginning of the season, but it seems more likely that the Sharks will go into the season as is and let their play in the first few months of the season dictate whether a big move is necessary or not. However, a slow start or a major injury could cause Wilson to reinvigorate his search for scoring depth. The New York Islanders have had a far worse summer than the Sharks and maybe any team in the league, but one of the franchise legends is still confident in the direction of the team. Hall of Famer Bryan Trottier sat down with NHL.com’s Dave McCarthy recently and spoke about the “bright future” of Mathew Barzal and the Islanders, despite the departure of John Tavares. “For him to… have the kind rookie season he had, he’s not disappointing anyone… I see wonderful things for Mathew in the future and for the Islanders”, Trottier stated. Between a legitimate rising star in Barzal and an impressive pipeline featuring the likes of Kieffer Bellows, Oliver Wahlstrom, Noah Dobson, Bode Wilde, and Robin Salo, Trottier is right that the future is bright, but the Isles will likely have to endure a few brutal years before they reach that point. Yet, Trottier also spoke to the credibility that new GM Lou Lamoriello and new coach Barry Trotz bring to the team and feels that with their leadership and the talent on the roster, the team can still succeed if others step up. This first season without Tavares will be telling as to how the team will fare in the coming years. Vitale played six seasons in the NHL, mostly with the Pittsburgh Penguins but wrapping up his career with the Arizona Coyotes after head injuries forced him into premature retirement. Now, he’s feeling positive about getting back into the game with his hometown team. Vitale was a high-energy player, a checking line regular and face-off specialist during his career, and will likely bring that same energy to the Blues broadcast.